Dr Nestor Demosthenous is one of Scotland’s more experienced Cosmetic Doctors, International speaker and author in Aesthetic Medicine. 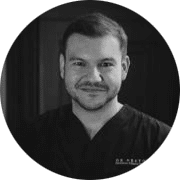 Dr Nestor holds regular fortnightly clinics in London’s Harley St at PHI Clinic and teaches frequently in the UK and abroad. Dr Nestor is passionate about Aesthetic medicine, skin health and the psychology of facial ageing. He is continuing to expand his knowledgeably undertaking an MSc in Aesthetics and Skin Health. Since introducing ZO Skin Health into the Edinburgh based Clinic there has been a strong patient following for the brand, with some incredible patient journeys. Dr Nestor mainly focuses on ageing skin, acne and rosacea.